Storytelling and self-promotion is nothing new and isn’t limited to this age of instant communication and reality TV. Storytelling and the ability to entertain and self promote, was a valuable skill to the early mountain men and fur trappers of the American West. To be known as a raconteur was a great compliment and so today, there are adventurers remembered more for the tales they told, than for their true exploits. At least two of these men, Black Harris and Jim Beckwith (Beckwourth) we remember, not necessarily for their feats of bravery or outstanding leadership, but for their ability to reinvent themselves, tell great tales of their adventures and sometimes even take credit for the exploits of others. Moses or “Black” Harris is also known as the “greatest liar of them all”, the term probably meant as a compliment, based upon his ability to embellish his escapades to entertain fellow trappers and traders. History marks almost nothing about Moses Harris before he joined the fur trade. He was one of the many men who answered the call and became famous as a man of “great leg” – one who was able to walk great distances alone, for extended periods of time. “Harris, the mountain men agreed, was the darnedest liar; lies tumbled out of his mouth like boudins out of a buffler’s stomach. But he was also a ‘man of great leg’, exactly suited to such a journey as this.” (“Jedediah Smith and the Opening of the West” by Dale L. Morgan). 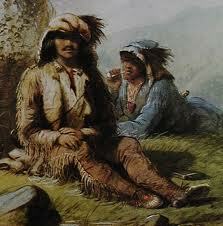 Alfred Jacob Miller, the artist, attended the 1837 rendezvous and documented Black Harris in the painting “Trappers”. Miller described Harris as “wiry of frame, made up of bone and muscle with a face composed of tan leather and whipcord finished up with a peculiar blue black tint, as if gun powder had been burnt into his face”. (“Jedediah Smith and the Opening of the West” by Dale L. Morgan). 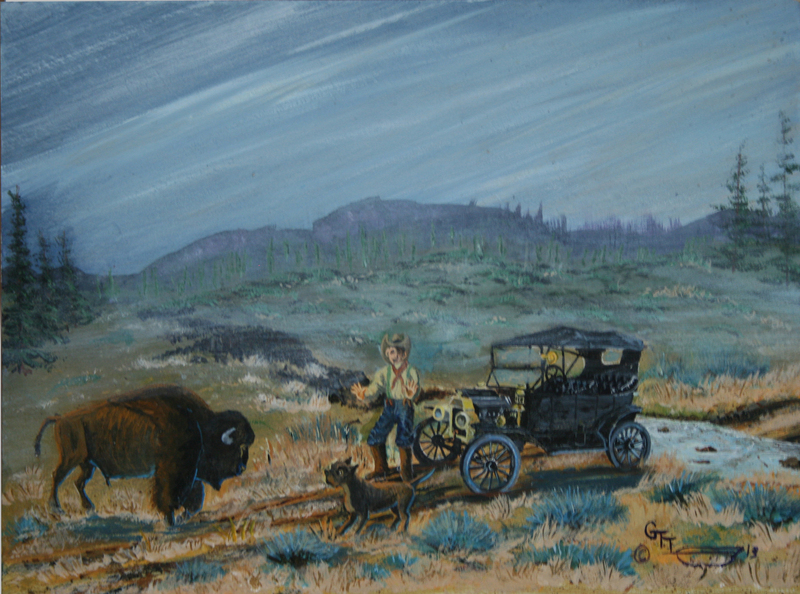 While Harris survived his time as a mountain man and fur trader, circumnavigating the Great Salt Lake and visiting Yellowstone, later becoming a guide for wagon trains heading to Oregon, he was known among his compatriots for the story of the petrified birds, sitting in petrified trees with petrified leaves singing petrified songs in Yellowstone. Jim Beckwith was the master of reinvention. Details of his life are shadowy, filled with myth and mystery, most inventions of his own. He’s believed to be the son of Jennings Beckwith and his slave – born in Virginia, but raised in Missouri where his father taught him to hunt and perhaps helped develop his sense of adventure. 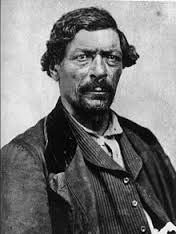 Apprenticed as a blacksmith, that skill that may have earned him entry into General William Ashley’s Rocky Mountain Fur Company where he soon created a new name, a new image for himself – Jim Beckwith became James P. Beckwourth, hero extraordinaire. He elevated himself to hero status in his stories, was described as the “gaudy liar” by his compatriots and adopted the persona of being the child of a Crow chief, stolen as a baby by raiding Cheyenne, sold to whites. Later on, Beckwourth claimed Crow Indians captured him while trapping in the border country, but because they thought he was the lost son of a Crow chief, they admitted him to the nation. Beckwourth lived with the Crow for at least eight years, rose to the status of Chief (respected man) and became leader of the “Dog Clan”. And, according to his book, he eventually ascended to the highest-ranking war chief of the Crow Nation. While he elevates himself to hero by his words, many of his actions convict him of duplicity, robbery and perhaps worse. Beckwourth was with the Crow party when they robbed Thomas Fitzpatrick (Broken Hand) and the Rocky Mountain Fur company (a competitor his employer) of all their goods: guns, goods, horses and pelts. 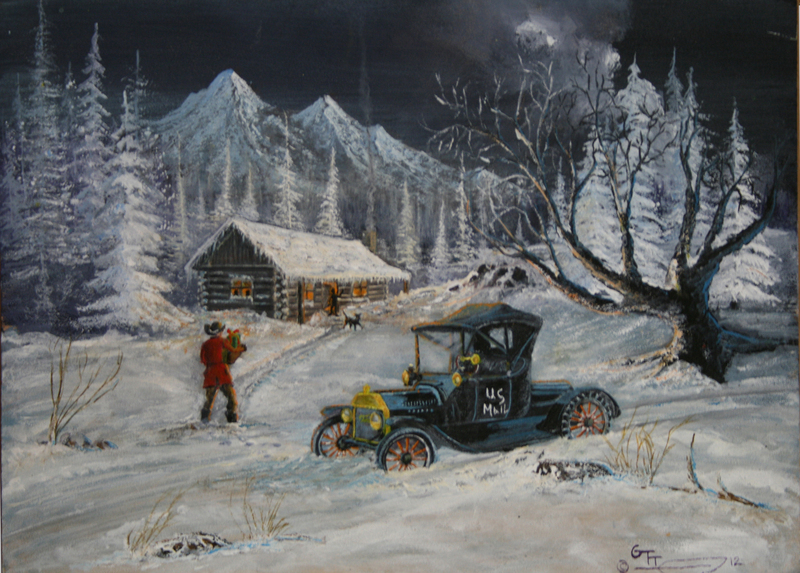 Other traders and mountain men believed he planned and instigated the robbery, although it wasn’t proven. Later, hired by Colonel John M. Chivington, he acted as a scout for the campaign against the Cheyenne and Arapaho, resulting in the Sand Creek Massacre. The militia killed an estimated 70-160+ friendly Cheyenne men, women and children camping in an area suggested by the previous commander of Fort Lyon, flying an American flag to show their status. These men were compatriots and acquaintances, who traveled together on more than one occasion. The facts of their lives are impressive, their adventures numerous. Simply enduring in the unforgiving mountains, living by their wits, meant that their hunting and survival skills were excellent. However, today we remember these mountain men as much for their skill in telling tall tales and their ability to self promote, than for their very real and impressive fortitude, bravery and skills. One last stop on a remote country road and this tired “Santa” finishes his route, but not before bringing joy to excited children and relief to tired parents. I wonder though, will he actually be able to make it home?